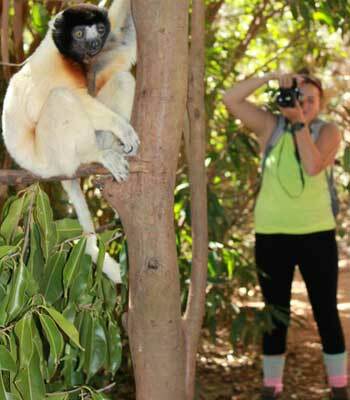 NIU husband-and-wife team Mitch Irwin and Karen Samonds observe a lemur in Madagascar. What won’t Mitch Irwin do in the name of science? 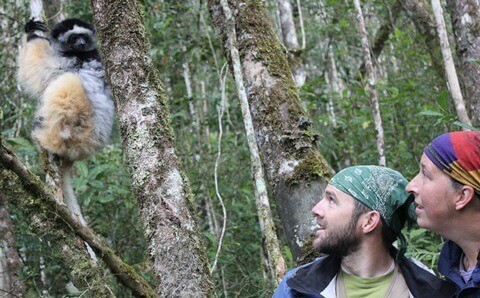 Irwin, a Northern Illinois University anthropologist, went to great lengths to collect data in Madagascar for a fascinating new study that sheds light on why primates live long lives. An international team of scientists working with primates in zoos, sanctuaries and in the wild examined daily energy expenditure in 17 primate species, from gorillas to mouse lemurs, to test whether primates’ slow pace of life results from a slow metabolism. Using a safe and non-invasive technique known as “doubly labeled water,” which tracks the body’s production of carbon dioxide, the researchers measured the number of calories that primates burned over a 10-day period. Combining these measurements with similar data from other studies, the team compared daily energy expenditure among primates to that of other mammals. 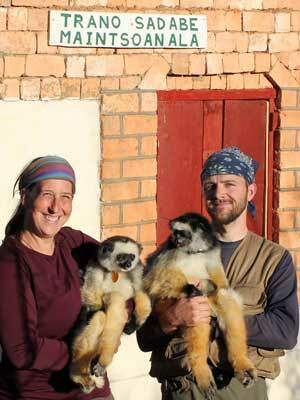 For his part, Irwin dosed and tracked lemurs in Madagascar, which he has studied over the past 14 years with his wife, NIU biological sciences professor Karen Samonds. They accomplished the initial injection during routine capture and health exams, but needed periodic fluid samples over the following week to get a measurement. 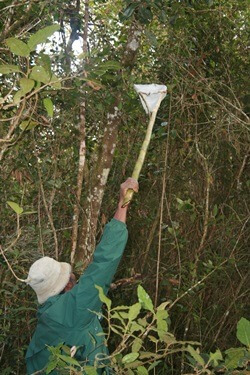 No easy task: collecting urine samples from lemurs. The new research shows that humans and other primates burn 50 percent fewer calories each day than other mammals. The study, published in the “Proceedings of the National Academy of Sciences,” suggests that these remarkably slow metabolisms explain why humans and other primates grow up so slowly and live such long lives. The study also reports that primates in zoos expend as much energy as those in the wild, suggesting that physical activity might have less of an impact on daily energy expenditure than is often thought. “I think the research will have broad impact,” Irwin says. He’s listed as an author on the PNAS study, but says the research was primarily driven by anthropologists Herman Pontzer of Hunter College in New York and Dave Raichlen of the University of Arizona. “I had known them for years, and they knew that capturing lemurs was part of my ongoing research, so it was a good fit,” Irwin says. Most mammals, like the family dog or pet hamster, live a fast-paced life, reaching adulthood in a matter of months, reproducing prodigiously (if we let them), and dying in their teens if not well before. By comparison, humans and their primate relatives (apes, monkeys, tarsiers, lorises and lemurs) have long childhoods, reproduce infrequently and live exceptionally long lives. Primates’ slow pace of life has long puzzled biologists because the mechanisms underlying it were unknown. This dramatic reduction in metabolic rate, previously unknown for primates, accounts for their slow pace of life. All organisms need energy to grow and reproduce, and energy expenditure can also contribute to aging. The slow rates of growth, reproduction, and aging among primates match their slow rate of energy expenditure, indicating that evolution has acted on metabolic rate to shape primates’ distinctly slow lives. “The environmental conditions favoring reduced energy expenditures may hold a key to understanding why primates, including humans, evolved this slower pace of life,” Raichlen says. Perhaps just as surprising, the team’s measurements show that primates in captivity expend as many calories each day as their wild counterparts. These results speak to the health and well-being of primates in world-class zoos and sanctuaries, and they also suggest that physical activity may contribute less to total energy expenditure than is often thought. Samonds and Irwin helped found Sadabe, an NGO developing innovative ways to promote the healthy coexistence of humans and wildlife in Madagascar. “The completion of this non-invasive study of primate metabolism in zoos and sanctuaries demonstrates the depth of research potential for these settings. It also sheds light on the fact that zoo-housed primates are relatively active, with the same daily energy expenditures as wild primates,” said co-author Steve Ross, director of the Lester E. Fisher Center for the Study and Conservation of Apes at Chicago’s Lincoln Park Zoo. Results from this study hold intriguing implications for understanding health and longevity in humans. Linking the rate of growth, reproduction and aging to daily energy expenditure might shed light on the processes by which our bodies develop and age. Meanwhile, unraveling the surprisingly complex relationship between physical activity and daily energy expenditure might improve our understanding of obesity and other metabolic diseases.